People, I’m getting as predictable as a Cathy cartoon. Take out your calendars, tick 28 days from now, and inevitably, this page will be topped with yet another chocolate-supporting confection. All month long, I look at this dark food of the gods, daily, I submit to a bittersweet bite, yet rarely do I desire to transform it into things. Baking disperses chocolate across flour, eggs, sugars and etceteras. It dulls its mighty intent, and personally, I prefer my chocolate potent. But then the moons change and suddenly I can’t get that last brownie recipe I saw somewhere, anywhere, out of my mind. Maybe this is The One, I’ll think, the one that will become my only. I look to my One and Only for support. “Please convince me that it would be a bad idea to make brownies,” I’ll plead. “Brownies?! You’re going to make brownies?! Woohoo! Hooray! Yay!” and that ear-to-ear grin terminates my attempts at hip-slimming righteousness in one flash. This month’s I-dare-you-to-look-away recipe came from Cook’s Illustrated. Can I tell you how much I love Cook’s Illustrated? For a person like me, the type who holds a near-obsessive need to know that their recipes will always work in precisely the way that they were intended to, who craves knowledge that they were infinitely well-tested and thought out, and not just made a certain way because that’s how it’s always been done, CI is a godsend. Sure, it foregoes a little artistry in the name precision, but it also supplies you with you-don’t-need-to-look-any-further perfections such as these. This is it, this is the recipe that has finally, and honorably, one-upped my beloved Baker’s One Bowl classic. I say honorably because the writer, Erica Bruce, takes her favorite recipe, one that sounds surprisingly similar to mine with an additional egg, a little flour and butter, and looks for ways to tune it up. The first thing she nixes is half a stick of butter, finding her typical brownie a little on the greasy side. This does the trick, but she has an unintended gritty side-effect she’s only able to lose by replacing all-purpose flour with the cake variety, which adds the bonus of a “delicate chew.” Next, she ups the sugar content by Ã‚Â¼ cup, after rejecting light and dark brown sugars for making the recipe too wet as well as leaving a distracting taste. Finally, she pumps up the chocolate flavor by adding 2 additional ounces of unsweetened chocolate (She finds that cocoa makes little flavor difference, and the semi-sweet chocolate flavor gets dispersed too easily.) as well as a small amount of baking powder to give them some lift. It was in these last two that she really caught my attention, as I’d long wanted to bump up the chocolate flavor in my Baker’s recipe and was impressed that you could add some leavening without making them cakey and blah. This recipe will be laminated and framed. A cooking note: Yes, I underbaked them. Again. This is a terrifically bad habit of mine, an aggressive overreaction to the dry cakes and brownies that abound. Some recipes benefit from baking times on the skimpy side. This does not. You must bake them until they are completely done or they can be too (yes, I know, hard to imagine) gummy and dense. That said, they are utterly perfect from the freezer, where they have been relegated out of sight in a feeble attempt to get them out of mind. Looky here! Artist Claire Murray has (adorably) illustrated this recipe, replete with UK ingredient and measurement conversions. Check it out. Be sure to test for doneness before removing the brownies from the oven. If underbaked (the toothpick has batter clinging to it) the texture of the brownies will be dense and gummy. If overbaked (the toothpick comes out completely clean), the brownies will be dry and cakey. Adjust oven rack to middle position; heat oven to 325 degrees. Cut 18-inch length foil and fold lengthwise to 8-inch width. Fit foil into length of 13 by 9-inch baking dish, pushing it into corners and up sides of pan; allow excess to overhand pan edges. Cut 14-inch length foil and, if using extra-wide foil, fold lengthwise to 12-inch width; fit into width of baking pan in same manner, perpendicular to first sheet. Spray foil-lined pan with nonstick cooking spray. If using nuts, spread nuts evenly on rimmed baking sheet and toast in oven until fragrant, 5 to 8 minutes. Set aside to cool. Whisk to combine flour, salt, and baking powder in medium bowl; set aside. Melt chocolate and butter in large heatproof bowl set over saucepan of almost-simmering water, stirring occasionally, until smooth. (Alternatively, in microwave, heat butter and chocolate in large microwave-safe bowl on high for 45 seconds, then stir and heat for 30 seconds more. Stir again, and, if necessary, repeat in 15-second increments; do not let chocolate burn.) When chocolate mixture is completely smooth, remove bowl from saucepan and gradually whisk in sugar. Add eggs on at a time, whisking after each addition until thoroughly combined. Whisk in vanilla. Add flour mixture in three additions, folding with rubber spatula until batter is completely smooth and homogeneous. I LOVE this recipe! Have made it several times and it never fails – even the time that I stupidly tried to take the glass bowl off of the boiling water with my bare hands and consequently got melted chocolate EVERYWHERE. and i thought your last brownies looked too good to be true! Meghan – I actually used the microwave method, having had it with using extra dishes lately, and it worked wonderfully. Careful watching is the trick, of course. Even better, no burned hands! I’ve never cooked one of the CI recipes before. I think I’ll have to give these a whirl! Thanks Deb. As always, you’ve got me so hungry before lunch I’m pacing at my desk. well, i now know what i’m making for dessert tonight. Thanx bunches. I’m still trying to get over my envy of the bread baking class you took (they just don’t have things like that out here). PS yesterday i bought the Gourmet Cook Book edited by Ruth Reichl, i’m in love. it’s worth taking a look at. Do these ship well? I’ll pay. I’m going to need them next Thursday (my 28 days). I think I slobbered on my keyboard. I’m sooo telling Ina that youre cheating on her. I pulled up the page…my darling husband walking behind me suddenly catches a glimpse of my computer screen, stops and says, “make your list and I’ll go to the store to get brownie stuff. I know to get milk, that doesn’t need to go on the list honey.” Should this happen after only 1 year of marriage??? Ah…the addiction to chocolate is a dangerous thing! 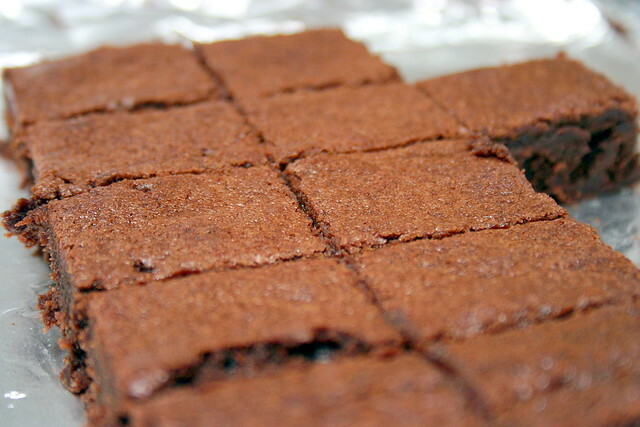 I will never tire of brownies, I want to make some right now. Unfortunately, the recipe didnÃ‚Â´t come out great for me. I mean, the taste was really good, but the ended up cakey after just 20 minutes in the oven (which apparently failed me yesterday) and I had a problem with the foil, which apparently wasnÃ‚Â´t quite resistant to heat. IÃ‚Â´m gonna give them another try next time I make brownies though, because they do have potential and they are easy to make. On the bright side, I went all out with a cooking festival last night and made the roasted acorn squash with chile vinagrete, the sweet potatoes with the spice mix (along with a personal interpretation of the capresse salad – confit tomatoes, traditional italian mozzarella and garlic-basil oil). My friends were totally delirious over the food. Too bad the dessert, which is my favorite part, didnÃ‚Â´t come out great (yes, I do admit to being a perfectionist, especially when it comes to my beloved brownies!). Wow, with such backup these have to be great and I am always on the lookout for “zee” brownie recipe! I will try them this week. Thank you for sharing! I made Martha’s brownies today, and I’d post about it if I could get Blogger TO WORK. GOD. I like mine a bit underbaked. I’m always unsure of whether mine are done and not, and the ones I tried to day were so thick I just gave up trying to figure it out. I cooked them about 7 minutes longer than necessary, and I’m told by co-workers tonight that they’re fine. But I think they’re kinda dense. How do you know? How do you ever, ever know? I have had consistently good look with Cook’s Illustrated recipes although for some reason I’ve never tried their brownie recipe. Based on these pictures, I need to try it immediately! 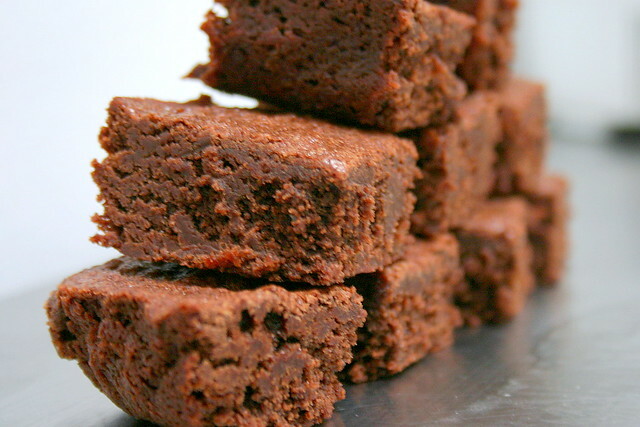 Your brownies are extremely photogenic. I know what you mean about the chocolate cravings. 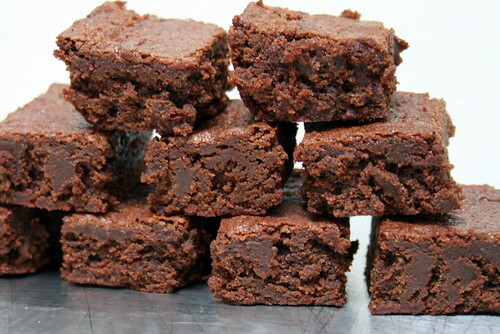 If I looked at these brownie pictures next week, I may just have to lick the screen. I agree with your comment that chocolate should not be diluted, but brownie can be that exception! I lost my fabulous brownie recipe and have been looking for a good one. Thank you! Nothing beats a good chocolate binge. It’s essential to every girl. And so is shoe shopping. They look fabulous- can’t tell they’re undercooked (because that’s how I prefer mine, too, for the same reasons as yourself). Yummy. I’m making cupcakes tonight though, you can’t sway me from that, but those look really, really good. I ADORE Cook’s Illustrated. If you do not have the corresponding Best Recipe cookbook, you must get yourself a copy IMMEDIATELY. It’s the absolute best of the best. And in indulging your obsession (with CI and with chocolate) you also feed mine. Thank you for sharing this must-try recipe and mouth-watering photographs (they don’t look underbaked to me). These look great and like a must-try. I’ve been happy with most things I’ve tried from CI. I’ve been a fan of theirs since the beginning. I crave their book of all the little kitchen tips. The brownie recipe I’ve always loved is Joy of Cooking’s Brownies Cockaigne. Mmmm. But then a friend told me that the Ghirardelli boxed mix is pretty much the same if not better. So now I’m hunting a competitor recipe! I like to use cocoa powder instead of flour for preparing the pans of anything chocolate that I’m baking. ok , what did I do wrong? I used milk chocolate and organic sugar (the only things different from your exact recipe) and my brownies turned out more like chewy, gooey cake bars (which were pretty darn good for being a big fat boo boo!) So where did I go wrong? THAT’s why I was baking these very brownies last night at nearly midnight! The moon! Silly me, didn’t make the connection. I tried this in an 8″ square pan, baked for 35 mins…yummy! Thanks for the recipe. Wow! I’m so glad I came across your comment! I’ve also a 8″ square pan and was wondering whether it’ll work…. I’m so going to start baking these!! I made these using agave nectar and a few other substitutions, and they were the best brownies I’ve made yet! Thanks! I made these last night and they were the best brownies I’ve eaten in recent memory. I didn’t have cake flour, so I used all-purpose, and it didn’t seem to matter one bit. I did a half batch in a 8″ square pan because I knew my husband and I have no self control and would eat the whole pan within 24 hours. We had some help eating them after dinner, but sure enough–they were gone by 9 am. I LOVE Cook’s Illustrated. I was just searching for a great brownie recipe, and did look at this one on the CI website. It’s good to see a great review of it here… you have convinced me this is the brownie to make for my little guy’s school Valentine party! I tried this recipe a couple of days ago and I found that I had to bake the brownies for 45 minutes until they were done. But, I think that my pan was a little smaller than the one suggested so that probably has something to do with it. Just thought I’d add my 2 cents for everyone else who tries this recipe. I found the brownies to be perfect – not too sweet and not too greasy. I just finished baking these fabulous brownies. I had a few snafus along the way but none of them were due to the recipe. They were mostly due to the baker – me. Someone had spilled oil down under my burner (under the burner plate and stove top) so just as the water was about to boil I could hear crackling like chicken was frying and the smoke alarms went off in the house!! Nothing caught fire (thank goodness) but I had to take a break and wipe down the underneath of the stove top. Then just as I’ve poured the finished batter into the foil-lined pan, I open the oven and slide the pan in only to find out that the oven wasn’t pre-heated. I’d turned the temperature knob but forgot to turn the “bake” knob on. UGH!!! The recipe was so easy to make. I used all ingredients to the letter (except no nuts). I made these for a friend at work who’s birthday is tomorrow. I think she’s going to be pleasantly surprised at how lovely and tasty these brownies are. Kudo’s to you again Smitten Kitchen!! Still #1 in my book(marks). is it possible to substitute the flour for whole wheat all purpose flour? there isnt thatmuch in the recipe, though i know it will still make a difference. i have a diabetic friend who i want to make these for – if i substitute the sugar for splenda thats fine, im just worried about the flour- do i dare try it? I LOVE Cook’s Illustrated. It is the phenomenal starting point for many of my “signature” recipes. This publication is highly “underrated”. Love your stuff and laughing out loud when I read it. And driving my friends crazy by telling them every other day to read a post because it is sooo funny. I make the bread recipes quite often. anyway cocoa… will it work? Marisol- I’ve made this recipe without unsweetened chocolate (subbing 3 T cocoa and 1 T oil for each ounce, so you have 1 cup and 2 T cocoa and 1/4 c and 2 T oil) and it worked just great. You can just put it all in when you’re melting the butter. Just be sure to keep stirring so there are no lumps. And these are good brownies, so they’ll be okay without the extra chocolate. Hi! I desperately want to make these brownies today, but I am getting a bunch of weird characters in the ingredient amounts (no matter what browser I use; Ive tried 3). Looks like a capital A with a carat or umlaut or somesuch over it. I can probably figure out the right amounts, but am a little nervous this character is replacing something important. Help? Jessica – Those carated A’s are just place holders, its different browsers rendering things incorrectly. I just made these brownies and honestly, if you’re even considering it, do it. It’s a job of work, but hey, that’s half the fun right? Gotta burn those calories somehow. These are the best brownies I’ve ever had. These make boxed mixes taste like cardboard (and not even good cardboard at that). yeah I agree with S, Katharine Hepburn’s brownies is my fav recipe!!! I just made a batch and they’re sitting, lovingly, on the upper level of home, away from hubby who is making a right greasy mess as we speak, cooking some concoction involving chicken. They look so pretty, I wish I could find my digital camera to take a pic. I reluctantly took them from the oven where they seemed a bit jiggly, but there’s been no collapse as of yet. I also substituted cake for reg flour and forgot the vanilla, drats! But they look and smell heavenly! Can’t wait to dig in! I just wanted to ask, could I halve this recipe and use it in an 8″ X 8″? I have a tiny oven and I can only use an 8X8! There’s no reason that wouldn’t work. Oops, is this in fahrenheit or celsius? I am baking RIGHT NOW and I fear it’s the wrong temperature, heh! Made these last night and they were delicious. However, I reduced the sugar by about a cup–no more than 1 3/4 cup is necessary! I also made these last night and thought there was WAY too much sugar! I would recommend to reduce the sugar if you don’t like your desserts overly sweet. I also substituted brown sugar for half the sugar and added one more egg yolk….cause I wanted fudgy brownies…… yum, yum, yum…. The only tweaks I made were reducing her butter content to your 1 1/2 sticks (about 170g) and avoiding the Earl Grey in the ganache, as I cannot abide by citrus (in this case, bergamot) with chocolate in any shape or form. I also put ALL the ganache in the refrigerator, as the maven-like instructions towards the end were just too much for me. I think the ganache is a nice touch if you want to add zing and glamour to the brownies, but they are just as yummy without. Thanks for the much needed inspiration! hi, I know this is an old recipe, but I’m dying to try it. a question: for cake flour, you say to use 1.25 cups (or 5 oz), but this does not equate. do you mean 1.25 cups OR 5 oz? MMmmmmmm a batch of these is in the oven now, and the smell is amazing. I cut out half a cup or so of sugar, and used 72% Valrhona chocolate, hope it turns out ok! I think next time will bake these in a 8X8 so they are a little taller. Thanks Deb! Oldie but goodie. Wow what wonderful photos of my favorite treat!! Great blog and recipe!! I made these last night, and they turned out FABULOUS! I honestly didn’t now a brownie could taste that good. My only experience, unfortunately, have been with the box kind. I’ve just never tasted chocolate in this way, and it’s marvelous. Thanks for the recipe-easy to follow, especially for me (a novice baker). Can’t wait to share these with my boyfriend and his family this weekend! Keep up the great work, I love your site! i made these last night, but i wanted Creme de Menthe like Brownies so i cheated and put in Andes Mints bits. Don’t know how I lived without your site… I can throw away my cookbooks now (well… not REALLY). I consider that everything comes pre-tested and the photos, of course, are the real seller. Thanks again for another winning recipe. Mmmmmm….. Chocolate… my own personal kryptonite. Wouldn’t cracking the eggs into the hot chocolate and butter mixture make them scramble? Or do we let the mixture cool before we add in the eggs? No. First, the mixture should not be simmering or anything close (that would burn the chocolate) but just barely warm enough for the chocolate to have melted. Adding the sugar lowers the temperature; the egg does not cook. However, if your chocolate mixture feels particularly hot, use your instincts and let it cool a bit before adding the sugar and egg. AHH!!! First, I absolutely love your site! I’ve tried some recipes and thoroughly enjoyed them! I just tried this recipe, but I’m not sure where I went wrong! I baked for 30 min as instructed and it came out beyond dry!!!! So, not exactly brownies, but with a little frosting…I have a nice chocolate cake? haha :) Thanks again for your great recipes! Thanks Lisa in Poland for the tip that you’ve used cocoa before – it’s all I had (with no money to buy squares), and so I used it, and it seemed just fine to me! I’m sure the squares would take it up another notch, but wow, I am still impressed. And Deb, freezing sounded like a brilliant save-my-hips solution, but then I ate one straight out of the freezer… and um, who needs ice cream or reddi-wip (becoming a staple in my fridge) when you have a perfectly cold treat all-in-one?! Okay, I guess that does help my hips since I don’t dollop the dairy on top. But uh, yeah… can you say sugar buzz? Thanks! I needed it! i’m just about to make these but i don’t have foil.. do you think wax paper would work? I don’t advise baking with waxed paper — the wax will melt into your food at a low temperature. If you have parchment, use that. If not, just butter and flour the pan well and it should work. They just might not slice as neatly as they would if you could pull them out completely. Deb, this really is the perfect brownie recipe. I’ve never done it with cake flour, but now that I’ve found a source I’ll definitely try it with my next batch. Love it! Um, amazing. I made these last night for a dinner party, and I’m trying to not eat the rest. Best brownie recipe by far…and super easy to make. Thank you! first time baker. I think I followed the recipe pretty well, except that i used bittersweet chocolate. The brownies were good, but were more cakey than brownie. where did i go wrong? I think i was “folding” the flour into the batter a long time…could that have been a problem? My brownies were done in abt 32 mins. after making lemon bars a second time and failing at it – did not use mixer, did not cream butter enough? base became sugar gritty instead of lovely and buttery, butter was melty. i decided to go for something easier and something that doesn’t taste of sugar (macdonalds’ soft serve i hate you, and That oatmeal raisin cookie/almond cookie brand that ruined my week). so, brownies! preparation took me 30mins but since i used a 9×9 with a full recipe at between 150C-175C (no 165C temperature setting), i took maybe an hour plus to bake and YET THEY WERE STILL NOT DONE. started to look burnt before 30mins so i covered with foil. Well, I made these and they turned out great, ‘cept that the sugar that didn’t dissolve in settled at the bottom and made this thin sugar layer at the bottom which is very displeasing to a perfectionist like me. Any ideas? I think the sugar we get in Pakistan has bigger grains, so it’s a bit difficult to dissolve easily, should I use confectioner’s sugar next time? I tried to cut back on the sugar by using Splenda Baking Mix. I DO NOT recommend using Splenda! It greatly changes the consistency and texture in a very bad way. I’m sure the recipe would have been wonderful had I used regular sugar. Deb, I know this post is ancient, but I am so excited to taste these brownies. They’re cooking in the oven right now and, as a total amateur, I finally outsmarted the Powers That Be! I don’t have mixing bowls. There, I said it. I just moved in with my boyfriend and I have been mixing everything in pots. Given my terrible luck with melting chocolate in the microwave, I decided that since I have no bowl to make a double-boiler out of..I’d make one! Metal collander + two layers of foil + wooden spoon = Yay! I didn’t mess something up! It actually worked wonderfully. I’m going double-duty on your blog and making the Blondies after this. Wish me luck. These brownies are fantastic. The only addition i did was a dash of Bundy Rum, must be the aussie in me. Great site good to see ya all down under Brownies now! I’ve made these a few times now, and they always taste amazing. The only thing I can’t figure out is why I can never cut them neatly. As soon as the knife goes in, they fall apart. Any ideas? thanks for the fab recipe – those brownies have yet to fail. they’ve always become absolutely delicious (i usually add a double espresso and 2 TB flour, it really pushes the chocolate flavor) and i totally love the dense consistency. the first time i read this recipe, i nearly fell of my chair though. is it just me, or why isn’t anybody bothering that this recipe requires an insanely huge amount of sugar?! it didn’t look so much to me, while reading the ingredients in cups, but using the information on ounces, i calculated the equivalent grams-amount… 446grams are nearly a pound of sugar!! and i don’t think there’s enough flour, nuts, chocolate or eggs to justify it. i’ve always used about 5-6 ounces of sugar and i think they’re still plenty sweet. when i once just halved the sugar, they came out a little too sweet for my taste. anyway, i don’t mean to thrash this recipe, it’s rather meant as a note for ppl who aren’t used to extremely sweet cakes. These are excellent! However, I baked them for 45 mins and I’d still think they are a bit underdone. I used a glass baking dish…maybe that makes a difference? Christina — Ovens can vary a bit. Just bake them until the toothpick comes out clean. These are definitely a good middle of the road brownie – not too fudgy and not too cakey; very much so what you’d think of when you think “classic brownie”. If anything, they’re a little more on the fudgy side than the cakey side. I halved the recipe and baked it in an 8 by 8 inch pan. I checked at 20 minutes, and they were still a little too moist, so I took them out at 25 minutes and the texture was just perfect. I thought I may have done something wrong because the batter was very thick once I had added all the ingredients, but I think it might have been because my eggs were cold (not room temp) so the chocolate seized up a little. After spreading it into the pan and baking, they turned out just fine. Although these are good, if I make them again I would add some espresso powder. After making Ina’s brownies, it seems that brownies made without espresso powder are missing something. Agree that these took longer than expected in the oven. I ended up cooking about 20 minutes longer than the recipe called for and they were still a little underdone. Even with an oven thermometer to keep my oven honest! Still, better underdone than overdone! Deb – I am about to make these for my hubby for Valentine’s Day. The only thing I do NOT understand is the bit about the foil in the pan at the beginning. Can you explain more what you’re talking about there or show a picture? The next time I make this recipe I am going to reduce 1/4 cup of the sugar and pump up the chocolate flavor with 2 TBS of cocoa powder. I thought the texture was perfect, they were just a little on the sweet side for me. So, needing my chocolate fix I made these today. Cut the sugar by a quarter cup, added some cinnamon to the flour mixture, and baked them in a 9 by 9 inch pan for about 55 minutes to an hour. They are perfect and almost completely gone! Exploding baked goods sounds like too much sugar…that’s the only time I’ve seen them run over the edges. So, I’m living in France with a bunch of American students, and I had to find something that tasted like home for them at our Easter dinner. I made these and they all said they are the best brownies they have ever had. It could just be the brownie depravation they are experiencing in Paris (have you tasted a French brownie? Not good), but I think they might just be right. Thank you for cracking the code of the perfect, made from scratch brownie for me. These are delightful! They got even better the second day. I cannot comment on how they tasted the third day because we finished them off about 24 hours after they were made. They are chewy, fudgy, and have a fantastically rich chocolate flavor! WOW! I made these last night and have subsequently thrown out all of my other brownie recipies. These are the best I’ve ever tasted. Perfect in every way. Thank you!!! Just making these now… they smell amazing. I can’t wait! We sold our home last summer and just moved into our new home last week. For the past year I’ve been living out of boxes in a temporary house WITHOUT all of my cookbooks and kitchen necessities. The baker I am thought I was going to die! Well, the day has come and I have unpacked my kitchen and am ready to bake. Brownies are on the top of my list. Your website has been bookmarked as a favorite of mine for about a year and a half (I made my husband your peanut butter chocolate cake for his birthday – amazing!!!) so I did a search to see if you had A brownie recipe. I was expecting one but never thought there would be six or more! I stayed up all night reading through them all and since I cannot pick just one, I’ve decide to make four. Peanut ButterBrownies, Classic Brownies (from Cooks), instead of Ina’s Outrageous Brownies I’m going with Nigella’s Triple Chocolate Brownies (sorry Ina – I DO love you, you will always be one of my favorites) and since my 2 year old is Gluten Free, I’m making some sort of flour-less brownie—still looking for the right recipe on that. Let the brownie baking marathon begin! I am sooooo excited!! Thanks for being the brownie lover that you are and for sharing your passion of food with me! I made this for our dinner party today and they were so good! Thank you! I’m not sure I’ll ever need to use another brownie recipe ever again. Pure perfection (I underbaked just a bit… but only because I couldn’t wait any more). Hi Deb! So I’ve searched around your site and can’t find what I’m looking for, but if I’ve missed it somewhere, please just point me in the right direction. I’m wondering if you’ve ever blogged about choosing a good baker’s chocolate or chocolate powder. So often I am disappointed in the chocolate things I make because there’s something funny about the chocolate. It tastes off . . . metallic, maybe. I’m not quite sure. How do you pick a good chocolate without breaking the bank on brownies? Thanks! Hi Liz — I haven’t really gotten into it. I say try different chocolates and find the lowest price one that has a flavor you like. I tend to use less fancy stuff in, say, a chocolate cake, and fancier stuff where the chocolate flavor is more intense, like a pudding/mousse/ganache or even a chocolate chip cookie, since the chocolate doesn’t get diluted at all. so insanely amazing. i always cone running to sk for recipes, and deb never ever fails me. this batter is fudgy, decadent, and heavenly. i added a pinch of columbian coffee and a dash of cinnamon to cut through some sweetness, and i love the mysterious flavor it gives. I made these and two of the three people I gave them to said they were the best brownies they had ever tasted. I agree. I did not change a thing but I used ScharffenBerger unsweetened chocolate and farm fresh eggs, I’m pretty sure that didn’t hurt. They were VERY dark and rich. I used pecans because that’s what we do here in the south. Thanks for a great recipe. i made these and they turned out like cake. now im craving brownies even more and dont know where to turn! Made these to take in to work tonight. Big hit! The girl I made them for requested chocolate and peanut butter, so I cut them into bite size pieces and dotted each one with the Fluffy Peanut Butter Frosting I found on The Girl Who Ate Everything blogspot. Perfect combo! I have also made your New York Style Cheesecake, Chocolate and Lemon Layer Cakes, and last week the Cranberry, Caramel and Almond Tart. Everything is amazing and is always recieved with delight by my wife and friends. Thank you. Hi, I made these brownies Sunday night and the inside was moist, but the top was very crusty. Does bread flour and cake flour differ? What about all purpose and cake flour? Please help! Thank you! Jason — What flour did you use? Bread flour has more gluten in it, and can make a tougher cake (but is good for cakes). Cake flour has less gluten, so it makes for a more delicate crumb. All-purpose is somewhere in the middle. I used bread flour. But the inside was fine, it was the top that became crusty. Does that mean I baked it to long or what? do these continue to cook as they cool? mine were left in for over an hour and still seemed to be very gummy, i’m waiting for them to cool completely now, i hope they’re not overdone, nothing more disappointing than dry baked goods! I attempted these brownies today but for some reason they rose to the high heavens (and onto the bottom of my oven). The result was gooey and delicious but I can’t figure out why they got so much air? I am at a friend’s house and only had a mishmash of pans at my disposal (the one I chose wasn’t very deep)… Any ideas? Made these today with Splenda instead of normal sugar (as the bf is diabetic) and it didn’t turn out very well. After 30 minutes the butter was bubbling along the edges and even after it was done (toothpick test), it was SO incredibly GREASY! We literally had to wrap it in paper towels…and it totally fell apart so I’ve put it in the fridge to see if it’ll stay together that way. Huge fan of your site, perhaps it was the splenda that created different results for me…I’ll be trying your baked mac and cheese tonight, as well. Hi Deb, I am torn.. if you had to pick between making the Classic brownies and Ina Garten’s caffeine brownies, could you pick one? Also, I have so much difficulty making banana bread and always overcook it, do you have any tips? Classic. I was not crazy about the Ina Garten ones. Don’t be afraid to bake these until they’re done-done. They have enough moisture built in that they will still be lovely in the middle when fully baked. I’ve been making a “light” family brownie recipe that literally makes light colored brownies. I’ve always been unhappy with the consistency of them though; they’re more fluffy like cake until they’ve sat in their own “steam” in my Tupperware. These are like heaven in a pan! I happened across your site by chance; definitely coming back for more! These are so fantastic! I did half semi-sweet and half milk chocolate – turned out a little lighter in color, but they have a delicious taste. =) I think the cake flour is a nice idea. I’m in Ecuador and don’t have much of a kitchen. But I need these now, an attempt with be made within days. My brother recently gifted me with some Mast Bros chocolate…the Spicy Serrano bar. I am thinking at least part of that bar is going to some good use in this brownie recipe. Oh. Yeah. I just baked this last night and devoured it at 3am++ ! It’s amazing, intense and gives everyone a brownie gasm, i just wanted to ask, is this supposed to be chewy? because mine isn’t (: I published a post on this on my site :D Many thanks deb! Love love love this recipie! :) We were snowed in today and these brownies were the perfect pick-me-up and cure to chocolate cravings. However, I didn’t have the self-control to wait two hrs for cooling so after the first 30 minutes, I stuck them in the fridge for 45 minutes and cut them. Worked out very well! Perfect brownie recipe. Exactly what I want in a brownie: dense but still soft, chewy, and very chocolaty. Love. These. Brownies! They are a perfect mix of fudgy and dense with a crisp top. I love the salt content, too. Delicious! I have made these twice and agree that they are outstanding. The first time I made them with 1 3/4 cup sugar and one tablespoon of Grand Marnier. They were definitely sweet enough and there was no trace of the Grand Marnier. The second time I made them I used 1 1/2 cups sugar. My conclusion is that these would be perfect with somewhere about half way between 1 3/4 cups sugar, and 1 1/2 cups sugar. They are fantastic and you can not help but to eat them right out of the pan. I’ll tell you that substituting milk chocolate does not work!! karyn I should have read all the comments before doing these… I only printed out the picture version of the recipe because I’m in the UK and those measurements are easier and they are just cooling right now but they look very light. I fear they are a dense slightly chocolate flavoured cake bars. Will know for next time! These are really amazing. I had company coming and needed some kind of a desert. I never made brownies from scratch before and they came out perfect. I am totally impressed with this recipe. The best brownies I ever had. Seriously. oh.my. i found this recipe via olivia from everyday musings & it is definitely the best brownie recipe i’ve tried. they are so gooey and rich & i love the bite of salt. i added a layer of strawberry syrup in the center & it’s a nice surprise. i think i’ll be using this recipe for years to come!! This was the first article I ever read in Cook’s Illustrated, and I was absolutely fascinated by all of their tedious testings and findings. I am presently addicted to both CI and these brownies! Glad you are sharing the knowledge of this awesome recipe with others! These turned out great. Of course I couldn’t let them cool before cutting out a test square. I used equal parts of almond and vanilla extract, and oiled the foil with about 1 tsp of peanut oil, creating the perfect nutty essence I was craving with my chocolate fix. Thanks for sharing the recipe. I made these, and the texture was absolutely perfect! However, mine were barely chocolate-y at all! They were several shades lighter than your pictures, and I could barely taste the chocolate-y-ness! I doubled the recipe and used 1.5 squares of Baker’s chocolate, since the box said each square was 10 oz. I’m sure I messed this up, I just don’t know how!! derpa derpa. a closer inspection of the package revealed that each square is ONE oz. haha no wonder they were so light! Deb, I made these and they were delicious!!! I love your blog, your recipes are so delicious! I can’t wait to see the cookbook you’ve been working on! Hey deb, I really really love your website. Every single recipe that I’ve tried so far has turned out so perfect in taste and looks! OMG, this recipe is amazing, the timing is wrong, I had to cook it over an hour, but it was worth it, all my friends loved it. My 11 year old granddaughter, the Blue Baker as she called herself, will be the judge! I just made these today. I think I underbaked them a bit because they’re a bit gummy even at 35 minutes at 350 degrees. The timing of this recipe seems difficult. You have to stop it before it between underbaked and done. They taste good though and since they’re kinda dense I’m just gonna tell people they’re super fudgey brownies. HII i lovee this recipe and wanted to make them for my vegan friend. could you ‘veganize’ this recipe for me!? thanks! another perfect recipe fr your site. thanks again for sharing! baked these today, adding toasted whole pistachios. soooo gooood!! I have made these three or four times now and each time they were delicious. I have followed recipe exactly, but my favorite is to use Green and Black’s 70% chocolate (bitterwseet) and slightly less (2 cups only) sugar. I once forgot to reduce sugar and just as good. These are in the oven now, full recipe, Baker’s unsweetened chocolate, with caramel too for a Turtle brownie twist. Using an 8 by 8 pyrex baking dish because I am making your granola bars with the 9 x 13 at the same time! Hope it comes out okay with increased cooking time. Deb, I am on maternity leave now and I am so glad I found your blog last year. I am an avid baker but usually play “beta cook” to my skilled hubby when it comes to everything else….with the extra time and temporary stay at home mom role, I am gearing up to be a contender in the kitchen-for all meals-pretty soon! Thanks for your great step by steps and photos! I should be sleeping while my daughter naps, but I cook :). I made these brownies twice this week.The first time, the brownies came out perfect- moist, chewy , dense and rich. The second time I baked the brownies, the texture was too gummy and the consistency was greasy. The difference? The brownies tasted delicious when I softened the butter and chocolate in a saucepan over slightly boiling water, and the brownies won raves that night from my boys and our whole family. When following the recipe the second time, I melted the butter and the chocolate in the microwave, instead of over a pot of boiling water, and the brownies were disappointing. This recipe is a keeper, and my family begs for this now! I was hesitant about making these because it seems that every homemade batch I make never can compete with my favorite boxed brand, however, these were delicious! I will definitely be making these again in the future! We don’t have unsweetened chocolate where I live. I can use semi-sweet chocolate instead, but I guess then I have to change the amount of sugar and butter. Do you have any idea how much sugar and butter will be fine? I’m terrible at baking things but I really want to bake these brownies :) Thanks! I made these today and they cooked on the top and the bottom but not the middle. I have made these before and they were perfect! Please tell me what I could have done wrong? I love your blog, by the way! I find these brownies to be on the goo-ier side so that sounds about right. If they were raw, however, they needed more baking time. I loved the way the brownies looked when they came out of the oven. Never in a million years did I think I could make such tasty looking treats. I made half of the brownies with pecans and the other half without. The brownies needed more baking time after the 30 minutes so I did another 12, and it worked. They are now cooling and I am anxious to eat them! I have tried your recipie and that was the best brownies which i have ever made. Really good in texture and in taste as well. Thank you so much for sharing such a easy recipie to make. Can I put choclate topping on it?? Made these, with pecans on top, for my son, home from college for spring break. Yummy, yummy – our new favorite brownie recipe! I just had mine came out of the oven and right away tasted it, I coudn’t resist it just have to have a bite….it came out great and tasty…will definitely make it again…and I have used whole wheat pastry flour and less sugar…it was still delicious! Thank you for the recipe! Consistently good brownies! So rich and dense and chocolaty. I make these once a year or so (made them about 5 times or so now), and then forget about how truly delicious and addicting these are. Each time I make it again I’m blown away by their perfection. Keeper of a recipe. Thanks! Your photos are beautiful and your recipes are a joy to read! Thank you! Great brownie recipe! Very beautiful photos! These remain the best brownies I’ve ever made. I use Baker’s Choice Unsweetened and they are awesome. Tried Ghirardelli’s unsweetened once and the texture came out completely weird. Anyway, this recipe is a keeper fa sho. Excellent recipe. I’ve made these no less than 2 dozen times and they consistently turn out. The children in my sons classes ask for these at all parties and my boys take them in for their birthday treat. Make sure you use a metal pan with the foil, glass will mess you up with brownies. For peanut butter/chocolate brownies: Reserve 2 tablespoons butter, and then melt with two tablespoons peanut butter; spread over top of brownie batter (after putting the batter in pan) and swirl with butter knife. Unfortunately, mine didn’t come good. But I was short a couple ounces unsweetened chocolate so I subbed both cocoa and semisweet chips in place of it. Also I baked them in a 13 by 9 glass Pyrex and yeah I reduced the oven temperature 25 degrees. They came way too crisp on the outside and actually too under baked in the center.Also tasted too sweet! But oddly enough I’d highly recommend their Lunchbox brownies, from the same book, they came great! I had a good square metal pan for those though. Hi. Quick question can I double this and bake it in a half sheet pan? I have been baking these brownies for years. One thing I do is substitute 1 tbsp. of Kahlua for the vanilla extract. I also just melt the chopped chocolate & butter together in a saucepan. I was debating between this recipe and your Favorite brownies recipe. Since I had the cake flour on hand and wanted a larger batch, went with these and they are really wonderful. Just what I was looking for as a classic brownie. No substitutions here and I baked for a full 35 mins. Next time I may consider checking a minute or two sooner. Thanks! Just made these and sliced my first one – delicious. Yum! Has anybody adapted this to include Oreos, or even better peppermint Trader Jo Jo’s? Was thinking of incorporating some broken cookies in the batter for a Christmas twist. There are recipes on the Internet but I turn to Deb and SK first for all things. Can you please specify how much butter we need in ounces or grams? Yikes, sorry about that. Old recipe. 12 tablespoons is 6 ounces or 170 grams. Wouldn’t 15 ounces of sugar make it too sweet? Also are 4 large eggs too much? When I made it- it came out like a cake more than a brownie. Also could you please specify all the ingredients in grams!